Cheats, Tips, and Level Guides for the popular mobile game, Candy Frenzy. Candy Frenzy is available to download for free now in the Google Play Store. Feel free to leave a comment if you have any questions or concerns. 133 Comments so far. Feel free to join this conversation. Level2-10 how to get pass it? Can’t pass the 2-40 level impossible to collect all the fruits in 120 secs. Same her i am stucked on level 40. Impossibel to collect all the fruits. I have been her now in 5 weeks. Soon i give up! CANDY-fruit-CANDY-CANDY, you bring the CANDY together and that would get rid of the fruit…I’m stuck and confused! I cannot get past level 3-6. This is NOT fun. I just started Candy Frenzy today and am on Level 16. Here’s an interesting piece of information, I think. You are supposed to have 140 seconds to get rid of 32 plates and get 4800 points. I used a Toastmaster Timing light and you are ONLY given 55 seconds, NOT 140. What’s up with this? Can’t get past 2-10. I’m getting ready to delete the game. It’s not fun anymore. How do I finish level 10 stage 2?! Stuck on Level 2 – 10 for a couple weeks now, Any tricks or way to pass it? DOES ANYONE HAVE A SOLUTION FOR CANDY FRENZY 2-10??? Can anyone catch a break on winning this game? 1- 27 i have play on this lavel many more times. Bt i cant win and get level up. Plss give me a solution.. If you play enough times you may pass 2-10. I almost passed it 3 times in a day, bUT every time when I have two fruits go up in a row in around 100 seconds, the game crash. So that becomes no fun , and I’m gonna delete it. Level 3-30 is ridiculous. You get 120 seconds to drop 9 fruit but have to break through the frozen balls before any can count. It takes 120 seconds just to reach the bottom without clearing any fruit. Once you reach this stage, the game is no longer fun. Ive made it to level 5 screen 41, I thought other screens were impossible. NO, THIS IS IMPOSSIBLE. May I have a clue please. On those other screens that were next to impossible, I stayed on one screen for two weeks. Persistent! Hi guys, I’ve noticed after a while if you can’t do certain levels something happens, I was stuck on 3 30 for a week then the ice disappeared then on a timed level I was stuck on the time froze so I could finish it, anyone else noticed this? Yes,the time froze for me on 2 different levels that I could not pass for weeks.Now I’m stuck on 5-45 wondering if I will ever get 6 fruits in 93 seconds. Frustrating for sure but I wouldn’t be this far if tome hadn’t froze on the others. Hoping it’ll freeze soon! Did you ever pass this?? I swear I have been trying for months ???? I am stuck on level 2.25. Any ideas? I am still on level 2-25. It’s not funny anymore. Level 2-10 is impossible to finish. I don’t even want to try anymore. Removing it is the answer. i am stucked on level 45 in the 5th palace 8windmill cafe. Impossibel to collect all the 6 fruits in 93 seconds. I’m here too. 5-45 is impossible. 5-45…. impossible. Anyone beat them? i am also stuck on same level pls help! Can’t get pass 5-43..what am I pose to do. Stuck on level 1-40 for weeks now. how do you collect the fruits before the time runs out. I always end up needing just one damn piece of fruit to finish the level but time runs out before i get that last one. How do u pass 4-1 ….. It tells u to get zero points and u have 60 moves,that’s impossible. Any tips to finish level 3-30? I cannot get pass level 4-1 it’s so annoying when you get 60 moves than it freezes after just one move!!!! Level 5-1 is impossible to finish. I don’t even want to try anymore. Removing it is the answer. level 5-45 is disappointing one. any cheat to stop the time and buy more time! Please can you remember how to smash the star level 10 – 17? I have tried everything smashing from above, below and from the side and nothing works….hope someone knows! I am stuck at level 25 dont knw how two collect da fruits and no one is giving me any tips gettin very annoyed ! and u have 60 moves,that’s impossible. i’m stuck at level 3-6, please give me any tips for clear it. its not possible to clear. I’m stuck in Candy Frenzy 2 Castle level’s 33 & 34 been trying for months please help? I know its not impossible but very very hard to crack..
6 fruits in 93 sec!!! Dafuq?? Level 3-40 !!! Really? I’ve been here for 3 weeks!!! Non stop almost. Does ANYONE have any suggestions? I have been RIGHT there…..only ONE plate to go, then the screen/game freezes. It’s happened more than a few times, I might add. Please help with ligit tips, please! My dignity is at stake here. 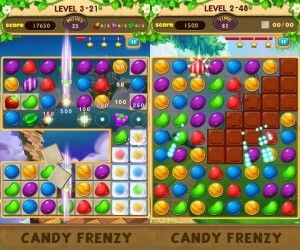 I can’t solve level 47 of candy frenzy………..can u suggest me any tips for solve this level….. I have been stuck on one particular level now for so many weeks. I have decided that enough is enough and will now delete this stupid hard game. The time allocated so certain games is ridiculous. Whoever made up this game thinks we are all so hooked that we cannot delete the game. Time trials are unrealistic, and some of the games which have a certain amount of moves also unrealistic. My answer to all the questions and requests above is DELETE and let others know of the UNREALISTIC game. I will stick with the original game of Candy Crush. The only good thing about this game is that you can keep playing and not have to wait for lives!!!!! Everyone DELETE!! I’m on 5-27 and can get the center square to clear. Boxes are limited to 4 per row, so no piece of candy possible (5 combo) to create to clear it…I’ve tried candy wrappers (3 up+3 down in one combo) and stripes (4 combo), and even smashed those combos together to try for a big bang, but still can’t find the correct combo needed to clear this square. I can’t solve level 35 of stage 2 ofcandy frenzy………..can u suggest me any tips for solve this level….. I completed level 10-48. I can’t open next level.. How i open.? Any tips for how to get passed the star candy? I have been stuck on this level for days & can not figure it out. I’ve reached level 10 & completed it but when i finish level 10 game 48 & i press ‘next’ it just repeats the same level 10 game 48 so how do i get to level 11 because I’ve already updated the app so it wont let me do it again so please tell me how i do this or i think i will delete the game as its no fun repeating levels you’ve already done??? i am stucked on level 45 in the 5th palace windmill cafe. Impossibel to collect all the 6 fruits in 110 seconds. level 10-26 seems impossible for me!!!!!!!!! !please help!!!!!!!!!! I too am stuck on Level 10-17. Did you figure it out? If so, how did you get passed the star candy? Did you figure out how to pass the star? How did you solve level 7-36? What about the cup cake that spits out purple blocks, can it be destroyed? How do you pass candy frenzie level 11-43. Stuck. I have the same problem…did you pass this Level ? I can’t get level 10 to unlock. I finished every game on level 9 so I’m not too sure what to do. Please help me, I really like this game but can’t play anymore. How to solve level 7-36 in Candy Frenzy? Please help to get rid of star candy level 10 – 17… how do you destroy it. doesn’t anyone answer questions asked? I would like to know about 10 -17. How can I get pass the candy star? Hi I have stuck at level 10-17 too. I’ll been deleted this game for few times and install back. Start all over again. But again stuck at 10-17. Please help. level 3-45. left hand panel simply freezes early on. If you start on that panel then you need to restart. Right hand side appears okay. How do I get out of 10/17 destroying the purple star.? All questions, no answers!!!! So you think this makes sense??? ?